Have you ever found yourself halfway through a sock before realizing that you were, well, halfway through a sock? I had this nice ball of Regia Bamboo “Jamaica,” you see. By mistake, I’d ordered just one from Carodan Farm (these things happen to me when I am not paying attention at checkout time), and the second ball hasn’t had time to arrive. That didn’t stop me, apparently, because here I am, about to turn the heel. Why did I start another sock? I just wanted to make a bamboo pair, I guess. I don’t even remember when I started it. Was it Thursday? Friday? It’s not that I don’t have a bunch of other interesting projects on needles. 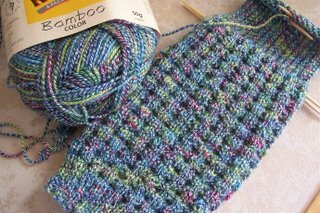 I’m about to turn the heel on my second Trek-Along sock, and I’m working on the cuff of my Hippy Crunchy sock, and I’m making another dishcloth. Most of these are mindless enough, except for the Hippy Crunchy sock, which is on a time-out until it quits hiding the yarn-overs. I have a basketful of other knitting that isn’t boring or unwanted, but each one is waiting for the right moment to get my attention. I gave up trying to cut back on the number of my current projects a long time ago. I am a knitting polygamist, and that’s that. So what do I go and do? I caved and ordered some Euroflax from Purl. A couple of Mason-Dixon Moss Grid hand towels are in my knitting future. Seeing them in person just made it impossible to resist any longer. Want to join me, Rho? My crazy work week went pretty smoothly, so I’m keeping my fingers crossed for the next two. The weather has been cooperating, keeping the Last-Half-of-August People happy. They are the toughest crowd, but I think we’re up to it. We have books, tons of books. We won’t run out of books, if I have anything to do with it. I’m reading (and laughing my way through) Nora Ephron’s I Feel Bad About My Neck because sometimes I do. Feel bad about my neck, that is. I’m also looking forward to listening to Jane Hamilton’s new book When Madeline Was Young. I love Jane Hamilton. I’m not enjoying, as much as I thought I would, the audio of Geraldine Brooks’ March. I think I’d rather read it on the page. Seems like I’m going to make it, doesn’t it? Just a little longer, just a few more grin-and-bear-it days, and then I can sit back and take pride in the good job I’ve done this summer. It’s barely light now when I get up at 5:30. Before long the days will feel shorter, and Autumn will come, and I’ll still be upright. Getting through a couple more crazy work weeks isn’t bad. Even though it’s still hot here, the days are starting to have Autumn feel to them. The days are getting shorter and the breeze is starting to get that unexplainable Autumn feel to it. I like that sock yarn. I think I need to branch out a bit. I get stuck in a sock yarn rut. What a pretty sock! Sometimes yarn just forces itself into your hands & says “knit me now.” 🙂 March – I recently picked it up (on paper) & it will probably be my next read. Oooo! I notice that too – about it still being dark at 5 now, instead of feeling like the day’s been going on a while already. Well. Thank goodness I adore the autumn. Today has that crisp feel to it! It blew in from the north during the night. Sweet sweet.Man – I adore that sock. deliciously lumpybumpy. Makes me want to stroke it. the new sock looks so wonderful – I have wondered about socks with bamboo, how do they feel to you? ?and yes… its only two weeks til labor day. You CAN do it! Almost there! You can do it! :)Hmm, I think I have that same color Regia Bamboo…. will it now tempt me from my Regia Silk socks? ?